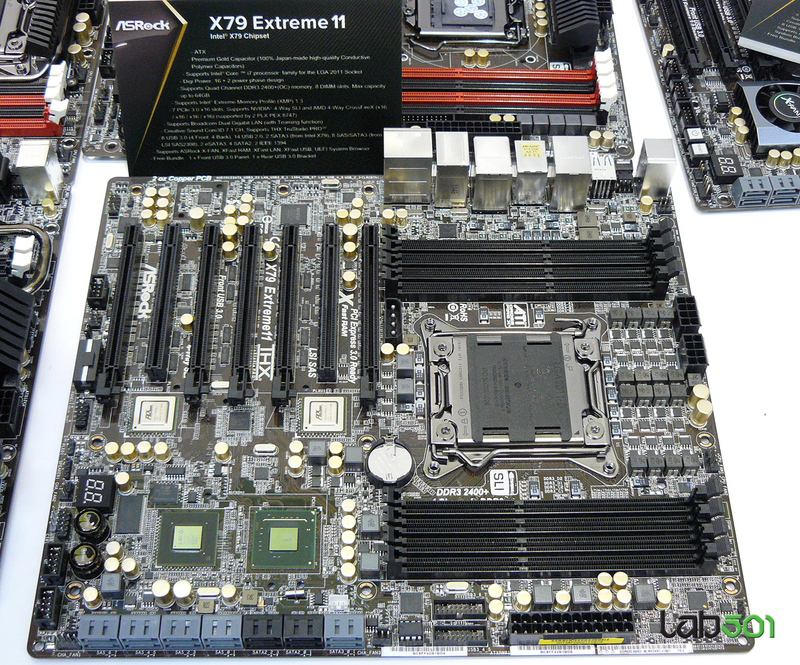 ASRock has showcased its final entry into the X79 Platform which is also the most badass motherboard the manufacture has ever produced featuring not only the usage for supreme overclocking but also the most powerful designed X79 board ever made on the EATX form-factor. 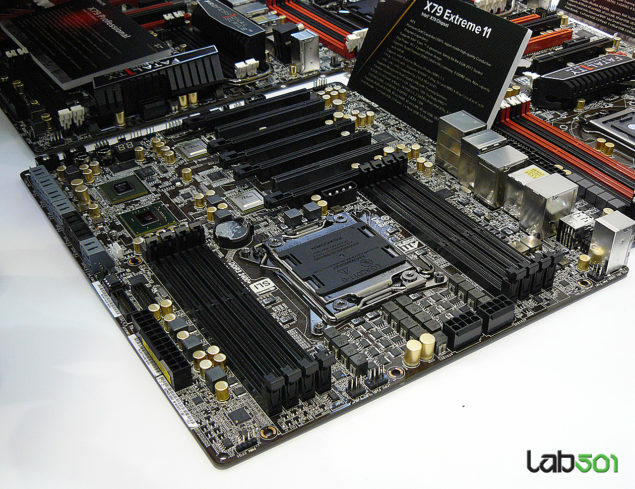 The board features the Socket LGA2011 processor to support Intel’s Sandy Bridge-E processors which are powered through 16+2 phase DigiPower VRM, Juice is provided through 2x 8 Pin Connectors. The motherboard has eight DDR3 DIMM slots (4 on each side of the socket) allowing support for upto 64GB ram with speeds of 2400Mhz+ OC. The memory is powered through an additional 4+4 phase VRM, two 4-pin Molex connectors are also fitted on the board to provide extra power when needed. 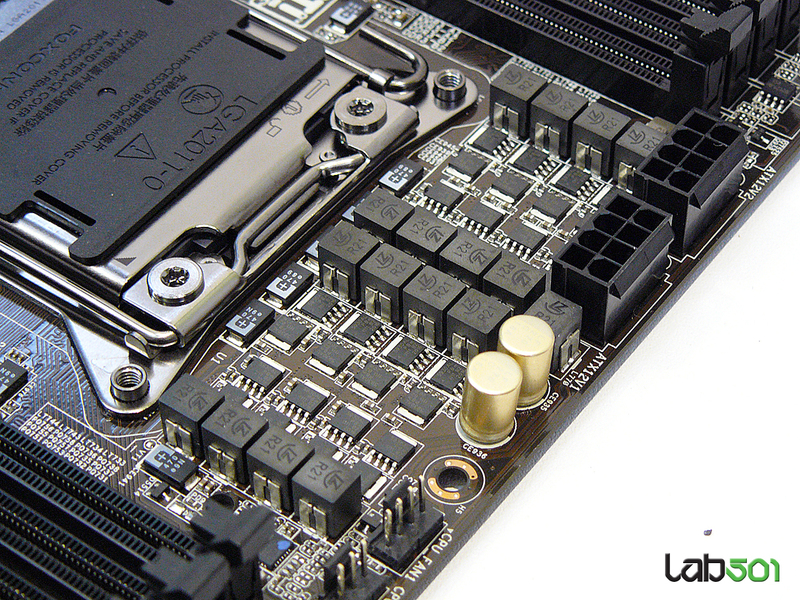 The X79 Extreme 11 provides upto 32PCI-e 3.0 lanes on the seven PCI-e x16 slots through the PLX PEX8747 bridge chip. Board supports Quad Way SLI and CrossfireX multi-gpu functionality. An LSI SAS2308 storage processor adds eight SAS/SATA 6 Gb/s ports featuring several Raid modes, An additional two SATA 6 Gb/s and four SATA 3 Gb/s ports are powered by the X79 PCH. I/O includes Creative Sound Core3D audio powered 8 channel jack, two gigabit Ethernet (Broadcom) and eight USB 3.0 ports (four on the rear-panel, four via headers). ASRock also provides exclusive features such as UEFI BIOS with System Browser, XFastLAN, XFastUSB. No heatsinks suggest that the board is still being prepared and would launch within the upcoming months.